M. William Shak-speare: H I S True Chronicle Historie of the life and death of King LEAR and his three Daughters. With the vnfortunate life of Edgar, sonne and heire to the Earle of Gloster, and his sullen and assumed humor of TOM of Bedlam: As it was played before the King's Maiestie at Whitehall vpon S. Stephans night in Christmas Hollidayes. By his Maiesties seruants playing vsually at the Gloabe on the Bancke-side. LONDON, Printed for Nathaniel Butter, and are to be sold at his shop in Pauls Church-yard at the signe of the Pide Bull neere St. Austins Gate. 1608. Na[thaniel] Butter / Io. [John] Busby. Entred for their copie vnder thandes [the hands] of Sr Geo[rge] Buck knight & Th[e] wardens. A booke called Mr William Shakespeare his historye of Kinge Lear as yt was played before the kinges maiestie at Whitehall vppon St Stephans night at christmas Last by his maities servantes playinge vsually at the globe on Banksyde. 3A second quarto of Shakespeare's King Lear was published in 1619, falsely dated 1608 (Q2); see my discussion of this edition below. 4Both the title page of the Quarto and the entry in the Stationers' Register conveniently record the first known performance: St. Stephen's Day (26 December), 1606. It would probably have been performed earlier at the Globe. The generally agreed date of composition is some time in 1605, after an somewhat fallow period in Shakespeare's writing career; it must have been written after the publication of Samuel Harsnett's engagingly entitled A Declaration of Egregious Popish Impostures in 1603, since from this work Shakespeare took the names of the "fiends" Edgar, as Poor Tom, mentions. The much earlier anonymous play The Chronicle History of King Leir (published by our sibling organization, the Queen's Men Editions) was printed in 1605; though somewhat dated in style it may have been revived before publication and may have been the stimulus that directed Shakespeare towards his radical rewriting and restructuring of the plot. 5The second version of the play appeared in 1623 in the First Folio (F), where the title was changed to accord with the division of the Folio into the genres of comedy, history, and tragedy: "THE TRAGEDIE OF KING LEAR" (Folio plays have no title pages). The two versions are significantly different in more than their titles: depending on the method of counting, Q1 includes approximately 285 lines not in F, and F records about 102 lines not in Q1. In addition there are a large number of individually varying readings in words, phrases, and speech assignments. Sonia Massai elegantly discusses the editorial history of the play, showing how varying social and ideological pressures have shaped the way editors have understood the texts ("Working"; see also Urkowitz, "'Base,'" Holderness "Introduction," and Halio Tragedy 65ff.). From the earliest editions to the late twentieth century editors assumed that Shakespeare had written a single play, which for various reasons had been garbled or corrupted in the two surviving versions; there were thus general attempts to re-create what was thought to be the closest possible approximation to Shakespeare's imagined original by conflating the two editions and making more or less eclectic decisions on which variant reading to adopt. 6Two late twentieth-century theoretical discussions significantly complicated this deceptively neat solution. As our understanding of the processes of the theater, print shop, and the creation of theatrical manuscripts has deepened, we have become more keenly aware of the production of a work such as King Lear as a social and collaborative activity; a corollary of this awareness is that scholars have become increasingly interested in looking at each version as a separate snapshot of a play that was in continuing change both on stage and in varying manuscript manifestations. The most important result of this revaluation has been a sustained argument that Shakespeare himself revised the play, and that the Folio version reflects this revision. Following early work by Michael Warren ("Quarto and Folio King Lear") and Steven Urkowitz (Shakespeare's Revision), Warren and Gary Taylor published The Division of the Kingdoms: Shakespeare's Two Versions of King Lear (1983), a collection of essays that argued strongly that the Folio Lear represents a conscious revision by Shakespeare. Three years later the new Oxford Complete Works edited by Taylor and Stanley Wells (1986) published two separate versions of Lear, one based on Q1, the other on the Folio. Since this important publication the debate about the legitimacy of a conflated text has continued and has been extended to include Hamlet, Troilus and Cressida, Othello, and other plays where Quarto and Folio versions differ significantly. Single-text editions of Quarto and Folio texts have appeared for many plays. 8However, not all scholars agree that deconflation is desirable or even possible. Richard Knowles uses the Quarto as his base text for his monumental Variorum King Lear (2018, forthcoming); his views are discussed further below. Brian Vickers in The One King Lear argues, in a curiously polemical tirade, that King Lear is really a single version where even the Folio additions can be explained away; and Peter Blayney, in a generally deeply critical review of Vickers's work, reveals that he regards the Folio text as a non-Shakespearian "adaptation" of the Quarto ("Quatrat" 64, 101). 9Whatever their views on the relationship between the two versions, editors of King Lear are squarely in the firing line. Ernst Honigmann points out astutely that even those editors who attempt to produce a "pure" modern text of Q1 or F end up, in effect, conflating, since they invariably use readings from the other text in their solutions to various cruxes: "Conflation appears to be unavoidable: the question is not whether to conflate or not, but rather how much to conflate" ("The New Bibliography" 87-8). R. A. Foakes's edition for the Arden 3 series prints a conflated version with variant readings and passages from Quarto and Folio clearly indicated by small superscript letters; Barbara Mowat and Paul Werstine's Folger Lear uses variously shaped brackets to distinguish the origin of different readings. The most recent Norton Shakespeare (Third Edition) includes parallel texts of each version of the play, together with what the editor, Grace Ioppolo, terms a "scars-and-stitches" version—similar in may respects to my extended Folio text; the previous version, which used the separate Oxford texts for Quarto and Folio, also provided a conflated version for the sake of convenience in teaching the play. In each case, the editors acknowledge the importance of providing readers with a version of the play that includes the widest possible range of information about what Shakespeare wrote, however different the extant versions may be. In a choice that echoes the Arden 3 edition of Hamlet where Q2 is privileged by having the first volume to itself, the New Oxford Modern Critical Edition (2017) provides its readers with a text of the Quarto only (King Lear and his Three Daughters, edited by John Jowett). The rationale for this choice gestures towards the same need for a reading text that is as inclusive as possible: the Quarto has been selected because it is "the longest early text" (2350). 10The question of the audience for any new edition of King Lear will be at the forefront of a publisher's mind, but will not necessarily be a primary concern for the scholar. At the core of the problem is the question: given the complex variation between the two versions of the play that have survived, what is Shakespeare's King Lear? In his remarkable experiment in multiple facsimiles and movable pages in the medium of print, The Complete King Lear, Michael Warren concludes the first paragraph of his General Introduction with this very fundamental question: "What is the work called King Lear?" (xi). Foakes picks up the same terminology in his Introduction, where he defines King Lear as a "work" divided into two separate versions: "there is every reason to think that we have two versions of the same play, not two different plays" (119). It does seem that scholars tacitly or openly acknowledge that culturally Lear is considered a single concept rather than two separate texts, even if this is the result of an editorial tradition that evolved many years after the play was written, rewritten, and published. Along these lines I have argued elsewhere that the variant texts of Shakespeare have acquired a "play-function" equivalent to Foucault's "author-function" (Best), with the result that an edition of King Lear that will actually be useful to those who consult it must in some fashion provide an accessible text that includes passages from both Q1 and F.
Confirming [Conferring] them on younger years [strengths]. 12While state/age and years/strengths are clearly differentiated, the variants first/fast and confirming/conferring might be the result of some kind of error. Stone considers confirming a misreading and first/fast a "true" variant (178, 224; see also Foakes 160), but the resonance between the words possibly differentiated by accident remains interesting from a critical perspective: the Folio's fast is more authoritative than the Quarto's first, and confirming reinforces other indications in the text that the actual division of the kingdom has already been made, making the "love-test" a pageant rather than a competition; conferring (like fast) expresses the sense of power that Lear is exemplifying in his actions. 13The digital space is ideal for creating a comprehensive revisioning of the rich multiplicity that is generated by the two versions of Lear. All texts on the Internet Shakespeare site offer multiple levels of information: facsimiles of early printed editions, searchable transcriptions of those documents, and one or more modern-spelling editions generated from them. 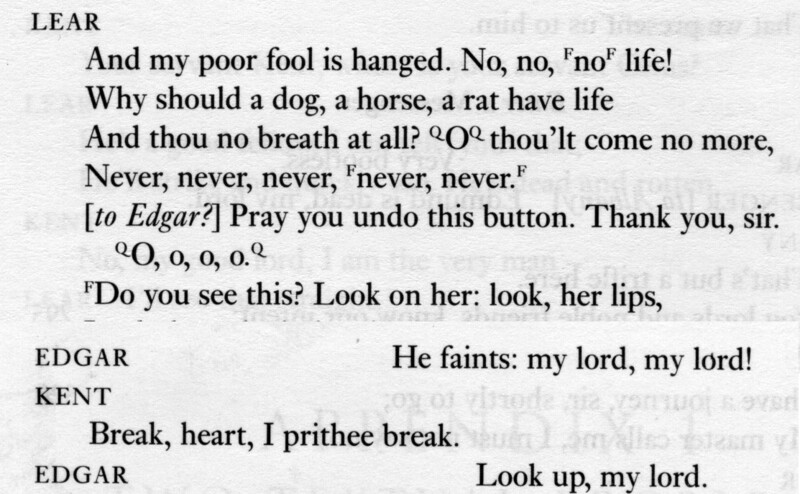 King Lear is one of the plays that requires more than one modern-spelling version, one each for Q1 and F; only Hamlet, with David Bevington's modern texts of Q1, Q2, and F demands more. The challenge is in finding a way to make the "work" that is King Lear readily available without asking readers to open multiple windows or trying to read two texts in parallel. With his long experience of the text to call upon, David Bevington's solution with Hamlet was to compile an "Editor's Choice" version, one that combines from the originary versions what he believes to be the most effective and complete text. 14My approach in this edition of King Lear is rather different. From the modern-spelling versions of both Q1 and F I have generated "extended" texts; each retains the integrity of the base text by leaving it unchanged, and clearly indicates material that has been added from the alternative version. There are, not surprisingly, some important passages where simply adding chunks from another source will radically change the nature of the base text, and where the two base versions differ in ways that addition will not signal. The climax of the play—Lear's last moments—provides a good example. 15 Quarto 1, TLN 3279-86. Courtesy British Library, shelf mark BL C.34.k.18. Folio 1, TLN 3279-86. Courtesy Brandeis University. King Lear ed. R.A. Foakes, 5.2.304-11. 17However, any editorial combination of these dramatically different sequences will confuse and diffuse the dramatic and critical effect of each original version of the passage. In the very few instances of this kind my solution is an enhancement of the often-used visual display of the two passages side by side. In the horizontal margin of each text are three tabs. The default shows the current base text; clicking on the second displays the alternative text for the given passage; and a third tab displays both passages in columns with the base text on the left. The result is a convenient and visually attractive reminder of variant passages, rather than a focus simply on variant readings. Horizontal tabs of this kind are used elsewhere in the edition, as I will discuss in the section below of editorial changes in lineation. There is no doubt that Q1 King Lear is a difficult and puzzling publication. It remains so even after decades of intensive research, from Doran (1931), Greg (Variants, 1940), and Stone (1980), to the remarkably meticulous scholarship of Peter W. M. Blayney (1982). Blayney discovered a great deal about the practices of Nicholas Okes's printing house and about the process involved in printing the Quarto. He has established that the manuscript was sufficiently difficult to read that the compositors set it seriatim—page by page—instead of by the more efficient method of "casting off"—a process of estimating where pages would be completed so that they could be set in the order of printing rather than the order of reading. In addition, he has demonstrated that Lear was the first play Okes printed, with the result that his compositors were inexperienced in reading the characteristics of play manuscripts; two compositors were involved in setting the play, one very possibly an apprentice. The manuscript Okes was working from clearly puzzled his compositors: a collation of the twelve extant copies shows that there were an unusual number of "stop press" changes made as it was being printed (see Greg Variants, Blayney, Warren Complete). I use the word "changes" carefully, because some attempted corrections rather muddy the waters than clear them. Most improve the sense and appear to reflect the original more accurately, but some look more like sophistications—attempts by the proofreader to make sense of a passage, rather than the substitution of a correct reading from the original. The pervasive problem is that it is ultimately impossible to be certain which reading was the original, which the result of the stop-press change. At TLN 1204 uncorrected Q1 has the nonsense word ausrent; in this instance it is more likely that the proofreader changed this to the plausible miscreant rather than the other way around (the whole phrase becomes "You stubburne miscreant knaue"). The Folio reading is probably the correct one: ancient. 19The consensus of recent scholarship is that the rather messy manuscript from which the Quarto was printed was an authorial draft in Shakespeare's own hand. Madeleine Doran first made the argument (1931) that the copy for Q1 was Shakespeare's rough draft, made difficult to read from corrections and revisions in the text. Steven Urkowitz (Revision, 1980) cogently supported and expanded her initial position. Blayney's detailed research has established a plausible bibliographical explanation for the unusually poor quality of the Quarto's text, essentially making it unnecessary to accept the more radical theories of transmission proposed by earlier scholars, that its imperfections were the result of some kind of memorial record of a performance or a reconstruction of a shorthand version of the play. Recent editors of the play have accepted the probability that an authorial manuscript was used by Okes in the production of the Quarto (Halio, Quarto 4-7, Taylor Textual Companion 510, Weis 3, Foakes 199-121, Wells 3, Jowett Reference Edition, New Oxford 1244-5). 20Q1 became the basis for a second quarto (Q2) issued as one of the "Pavier" quartos of 1619. The fact that the title page falsely gives the date of publication as 1608 led Greg to argue that the group of plays published by Pavier were fraudulently published against the wishes of the players (Greg Folio 11-17); more recent consideration of the evidence has challenged this assumption (Johnson; Massai, Rise; Clegg). Massai argues that the false dating was intended to allow publication of the plays both individually and as a "nonce" collection; she also suggests that it may have been intended to provide advance publicity for the future Folio (Rise 112-21). While there is no certain indication that Q2 introduced any authoritative changes, it is valuable as a witness to the kinds of corrections a contemporary apparently found necessary and reasonable (See Massai, Rise, 121ff). It is striking that Q2 was printed by Jaggard, the printer of the First Folio; a copy was almost certainly available in Jaggard's shop at the time his compositors began work on King Lear in its Folio version. 21It is therefore not surprising that there is evidence that the Folio version of King Lear was in some form influenced by Q1, most probably through Q2, though the process by which the texts interacted is contested. Thomas L. Berger, in a review of the Oxford Works published in 1986, commented that "Just as we create fictions to get through the day, bibliographers and editors create fictions to get through texts" (161); fictions they may be, and editors would do well not to believe too much in them (see also Werstine "Narratives"), but some kind of fiction is inevitable as a guide to consistent editorial choices. There are two narratives that have gained some degree of currency: that the compositors worked from a version of Q2 that had been annotated by consultation with a manuscript used in the theater, or that they worked directly from such a manuscript, consulting Q2 where they ran into difficulties in reading it. Trevor Howard-Hill argues that the copy for the Folio was a manuscript rather than an annotated print copy of either Q1 or Q2; his preferred narrative is that a "collator" used a print copy of Q2 to clarify difficulties in the playbook he was asked to transcribe for the printer ("Problem" 23; see also Doran Text 112 and Halio Tragedy 73). An alternative, perhaps simpler narrative is offered by Richard Knowles ("Evolution"; see also Halio Tragedy 75). He suggests that Q1 was derived from foul papers that were copied by a scribe for the theater, and that this fair copy was then subjected to the usual process of evolution within the theater with cuts and revisions undertaken by Shakespeare or others; the final copy of this manuscript was used to set F, with the compositors referring with some frequency to Q2 to clarify difficulties in the manuscript. 22The crucial point in all these narratives is that each surviving text had some direct contact with Shakespeare's original draft or drafts. Q1 is very close to Shakespeare but is muddied by messiness in the manuscript and ineptitude in the printing house. F, in its turn, probably began its life in the theater as a scribal or authorial copy of Shakespeare's final draft, but it was subsequently modified by hands that might or might not have been Shakespeare's. Whatever the origin of the printer's copy for Q1, the modern editor must intrude to a significant degree to make the text accessible to today's reader and to find acceptable readings for many difficult passages. It remains true that the specific causes of many of Q1's obscurities remain unexplained, or, in many cases, capable of multiple, and conflicting explanations. The Folio text is a far better printed text than the Quarto, with fewer obvious errors, but it has been reworked in a number of important ways. The reviser, or revisers, cut quite long passages, added a number of generally shorter passages, altered speech assignments, changed a large number of individual words, and shifted the dramatic and critical effect of some passages through a series of smaller changes.